Ate his wife and divorced his lunch. Well, did you evah? What a swell party this is!" 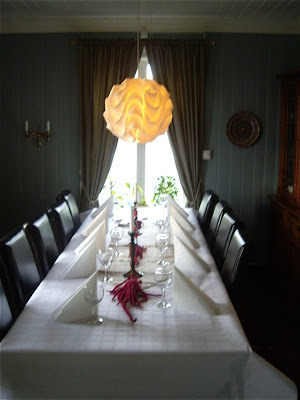 September 28th my friends Øyvind and Stian celebrated their 30 years times 2 party, made into a 60th anniversary. These two guys have succeeded in more than one way, and the party was no exception. It was a swell party, and what food. If married to it, I would never need a divorce, and there were no need to eat neither you wife nor your husband. The party had been in progress from the previous Wednesday, as most of the extended family had been busy preparing food for the arriving guests. We were over 50, all in all, and the buffet had a wide variety of food in abundance. Thinly sliced cold roast beef, delicious when served on dark or rye bread with raw onion and tartar sauce or remoulade. Here the roast beef was served with small pickled onion. 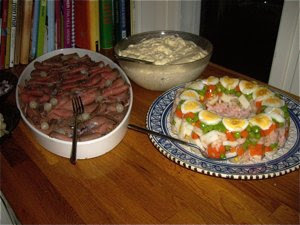 Fiske kabaret or fish in Aspic - shrimps and other fish or shellfish with hard boiled eggs, peas and carrots in aspic. Served on white bread with mayonnaise. What would a party be without cured products. 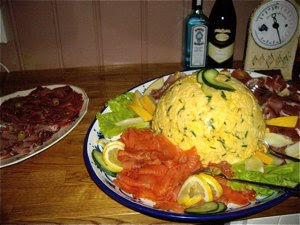 Delicious smoked salmon in thin slices served with scrambled eggs. There were cured smoked ham in abundance, and I had brought delicious cured chorizo bought in Spain in June, dripping with olive oil and pimentos. The best of Southern and Northern Europe! Øyvind and Stian had visited Lisbon a few weeks earlier and this dish was inspired by one enjoyed in Portugal. 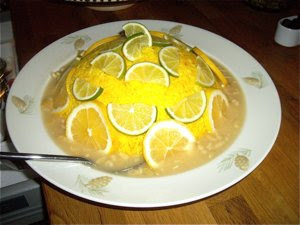 Rice with lemon and lime, an interesting delicious and highly unusual combination. Crispy salad and pasta salad with multi coloured fusili. Delicious small spicy meatballs in an aromatic tomato sauce. Cheese and crackers and cakes. I particularly remember a chocolate cake brought by Hans Christian, a friend. Sinful and wicket. Succulent chocolate sponge with a creamy sweet chocolate sauce with an indecent amount of hard liquor. This was a party with happy people that love food. No divorces or cannibalism in sight!! That bands, it's the end! Kindly don't fall down my friend.